BERKELEY, Calif. (AP) — The annual Big Game between Stanford and California always comes with the pageantry and intensity befitting a rivalry between two schools less than an hour apart. This year’s showdown features something that has been a little unusual over the past few decades: two successful teams. When the Golden Bears (7-4, 4-4 Pac-12) host the Cardinal (7-4, 5-3) on Saturday it will mark just the second time in the past 27 seasons that both Bay Area schools come into the game with at least seven wins. The teams have traded runs of success over the years, with Stanford being the dominant force the past decade, winning eight straight meetings for the longest winning streak by either school in a series that began in the 1800s. Cal’s last win came in 2009, which was the only other time since 1991 that both teams had seven wins at the time of the showdown. But in Wilcox’s second year, the Bears are a vastly different team than they’ve been in the past with a defense that has been dominant at times. Cal has held its last five opponents to 21 points or less and the defense forced five turnovers and scored two TDs in last week’s win over Colorado. DELAYED GAME: This matchup was originally scheduled for Nov. 17 but was postponed two weeks because smoke in the Bay Area from a wildfire about 150 miles away was at a dangerous level. Both teams already had a full week of preparation before the game was pushed back and spent this extra week just tinkering with the game plan. 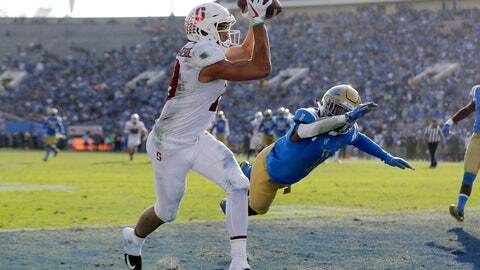 JJ’S JUMP BALLS: Stanford’s best offense has been having K.J. Costello throw the ball up to JJ Arcega-Whiteside and letting the physical receiver come down with the catch or draw a penalty. Arcega-Whiteside has caught 14 TD passes, tying the school record set by Pro Football Hall of Famer James Lofton in 1977. Arcega-Whiteside needs four TD catches in the final two games to tie the conference record set by Washington’s Mario Bailey in 1991. MILESTONE CHASE: Bears running back Patrick Laird has rushed for 816 yards this season and scored nine TDs. With 184 yards in the final two games of the season, Laird can become just the third player in Cal history with two 1,000-yard seasons in his career, joining Marshawn Lynch and Russell White, who did it three times. CALIFORNIA KINGS: The Cardinal have already beaten L.A. rivals UCLA and Southern California and can sweep their three in-state conference opponents for the third time in four years by beating the Bears. Stanford also swept the three in 2015 and ’16 and has a 22-4 record against those schools during Shaw’s tenure. The Cardinal also beat San Diego State and UC Davis in the nonconference season, giving them four wins against in-state schools.